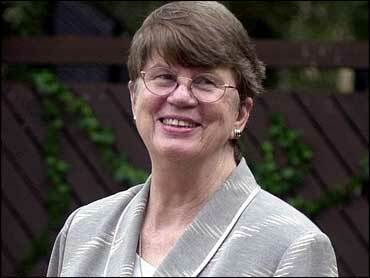 Problems with Florida's new election system kept Janet Reno's battle for the Democratic nomination for governor undecided Wednesday, a day after the primary, while New Hampshire Sen. Bob Smith lost his GOP primary. In North Carolina, Elizabeth Dole coasted to victory in the Republican Senate primary and will face Erskine Bowles, who won the Democratic nomination. Voters in 12 states on Tuesday determined fall lineups for six open governor's offices, three of the most competitive Senate seats and a few House seats that could influence control of Congress and the shape of the remainder of President Bush's administration. In Florida, Reno was narrowly trailing lawyer Bill McBride. With 97 percent of precincts reporting, McBride had 596,472 votes, or 45 percent, to Reno's 577,380 votes, or 43 percent. State Sen. Daryl Jones had 154,367 votes, or 12 percent. Prospects for a quick resolution dimmed when several counties suspended counting overnight. They were to resume later Wednesday. A new $32 million election system put in place after the 2000 Bush-Gore presidential debacle failed miserably in its debut: Ballots jammed, machines malfunctioned and Gov. Jeb Bush — who will face the winner of the Democratic primary in November — ordered polls to stay open late. "This is ridiculous," said Karl Williams, who voted in Miami's Liberty City section before machines malfunctioned but returned in the afternoon to complain about the problems. "They should have kept the old system. They're trying to play the games again. They're going to stop people from wanting to vote for anybody." Reno remained in striking distance as South Florida counties where she held a better than 2-to-1 margin still counted votes. Her once-commanding lead in polls had vanished by Tuesday as McBride, a political novice, gained momentum. The tight race already has stirred talk of potential challenges from Reno's campaign. Tuesday marked the busiest election day of the year. With control of Congress split and held by a narrow margin, the November elections could tip the balance either way. While the Democrats have a one-seat Senate edge, the GOP holds the House, with 222 Republicans, 211 Democrats and two independents. Smith angered many of the party faithful when he bolted from the Republicans in 1999 for an ill-fated presidential run as an independent. He returned to the party months later. "As Charles Dickens said, `It was the best of times, it was the worst of times,"' Smith said in his concession. "I was hoping it was going to be the best of times, instead of the worst of times tonight." Sununu, a three-term congressman, is the son of John H. Sununu, the former New Hampshire governor who was the first President Bush's chief of staff. He will face leading Democrat Jeanne Shaheen, the popular three-term governor, who ran unopposed. The two began trading charges immediately. "Jeanne Shaheen is a liberal Democrat. She supported Walter Mondale; she supported Al Gore," Sununu told cheering supporters. Shaheen said she and Sununu disagree on every issue. "On health care, on education, on the environment, on the economy, on who should get the tax breaks — big corporations or middle Americans — he and I differ," she said. In the race for Jesse Helms' Senate seat in North Carolina, Dole, a Cabinet member in two Republican administrations, will face Bowles, chief of staff for former President Clinton. particularly its troubled textile industry — on the Democrats. "For eight long years, Clinton administration policies undermined North Carolina's economy, and years later we're still struggling to overcome that," she told supporters. Bowles wasted no time in criticizing his opponent. "When North Carolina gets to know where Mrs. Dole stands on the issues — and I hope some day she will tell us — they will find out ... that Mrs. Dole is out of step with the citizens of North Carolina," he said. In a third crucial Senate race for the fall, Democratic incumbent Paul Wellstone and Republican Norm Coleman, mayor of St. Paul, easily won their primaries. Two-term New York Gov. George Pataki faced no Republican opponent but lost the Independence Party nomination to billionaire businessman B. Thomas Golisano. That means Golinsano's name will be on the November ballot, along with that of state Comptroller H. Carl McCall, who won Democratic nomination a week after former federal housing secretary Andrew Cuomo dropped out. Multimillionaire Craig Benson defeated two other candidates, including former Sen. Gordon Humphrey, for the GOP nomination for New Hampshire governor to succeed Shaheen, who served three terms. In Washington, D.C., Mayor Anthony Williams ran a write-in campaign after he was dropped from the ballot for petition irregularities. He faced the Rev. Willie Wilson, also a write-in candidate, in a race likely to decide the fall winner. Results weren't expected for days. In Maryland, Democratic Lt. Gov. Kathleen Kennedy Townsend and Republican Rep. Robert Ehrlich won their parties' gubernatorial nominations. State Sen. Christopher Van Hollen defeated Kennedy cousin Mark Shriver for the Democratic nomination to challenge eight-term GOP Rep. Constance Morella.